Could I possibly be less excited about my slate of current projects? I plan to redo the toe of my magic stripes sock. but i hate frogging, even if it's for a purpose. i need to start the second canada sock, but i'm having SSS. i already made one. do i really need another? i'm starting to think that the secret project was a bad idea and that the yarn could be used for something else more appropriate. i finished the back of butterfly, which means that i've already forgotten about having to make a front. so that leaves the cable eight top. there is really no excuse for this one taking so long, except for my lack of enthusiasm, so last night i finished knitting the second half. all i need to do is the crochet edging and seaming, and then i'll be done. now i can start taking bets...see how incredibly narrow it is? do you think it'll actually fit me? there was kind of a point to knitting it the size that i did, but now i'm not so sure. all i can do is wait and find out. there will be no verdict until this thing has been washed and worn for awhile to account for any potential stretching. i received my amazon order yesterday. i got "vintage knits" and "folk socks." i am very excited. i can't wait til my yarn gets here so i can start the norwegian stockings. i also love many of the patterns in vintage knits. it may be the source of my slump. i want to quit all of my current projects in favor of starting something new. but no, i will finish at least one thing first. i think i'm also confused by the ever-changing weather. 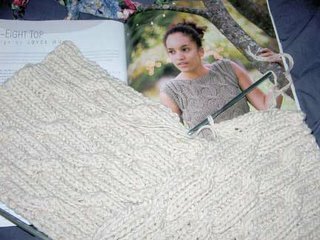 should i make winter sweaters or fun spring knits? it keeps changing so rapidly that i don't want to do either. i'm also getting a cold. The cables will stretch out laterally when you wear it, so the narrowness will probably work out fine. You'll want that extra length. After that first run through the dryer, it's going to shrink up by about 15%. I'm in the same "just finish it, already!" boat, so I know where you're coming from. Good luck, and shake off those blahs!